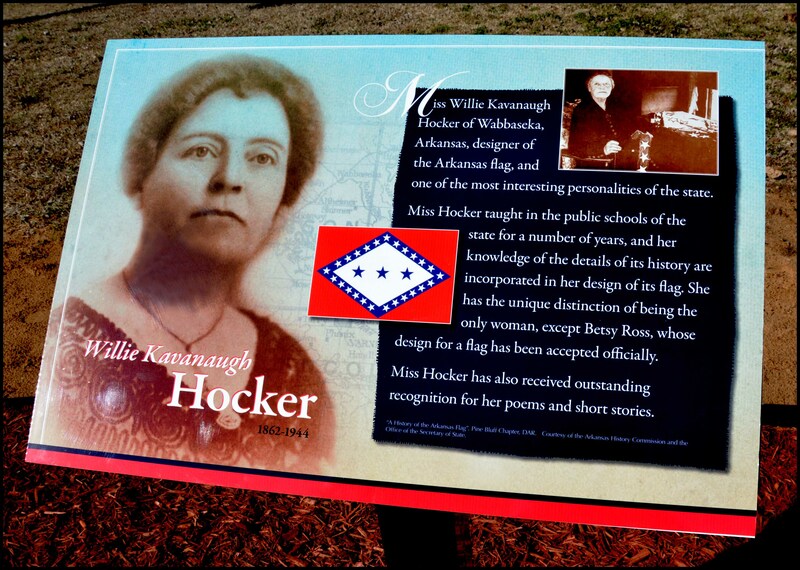 Miss Willie Kavanaugh Hocker of Wabbaseka, Arkansas, designer of the Arkansas flag, and one of the most interesting personalities of the state. Miss Hocker taught in the public schools of the state for a number of years, and her knowledge of the details of its history are incorporated in her design of its flag. She has the unique distinction of being the only woman, except Betsy Ross, whose design for a flag has been accepted officially. Miss Hocker has also received outstanding recognition for her poems and short stories. “A History of the Arkansas Flag” Pine Bluff Chapter, DAR. Courtesy of the Arkansas History Commission and the Office of the Secretary of State. For more information on Willie K. Hocker, visit The Encyclopedia of Arkansas History & Culture website.